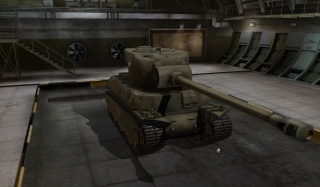 Der M6A2E1 ist ein amerikanischer premium schwerer Panzer der Stufe 8. Originally available as part of the game's Heavy Pre-Order Package. 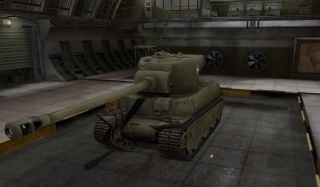 It is an M6 hull with almost doubled front armor plus a prototype (weaker and larger) T29 turret. Thanks to the rather strange looking fusion, this tank has earned the nickname of "mutant". 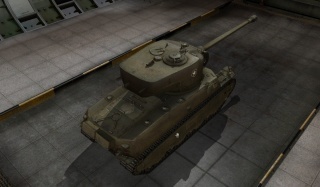 The M6A2E1 has an imposing slab of armour on the front, measuring out to almost 240mm after including slope. Flanking this tank is a good idea since the side and rear armor are especially thin. The same 105mm gun as the T29 and T32 is mounted on the M6A2E1 with a lower rate of fire. It has reasonable manoeuvrability for a heavy tank, but a speed cap of 29 km/h discourages major map travel. The playstyle of an M6A2E1 driver is to manoeuvre so that its weak sides are always covered by its frontal plate or hard cover then use that solid protection to smash down opponents with its decent 105mm gun. Through sheer armor thickness and difficult frontal weakspots this is brutal against lower tier tanks and challenging for equivalent tanks of its own tier. 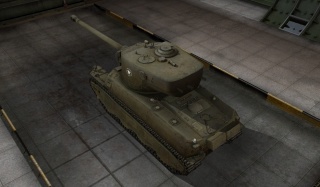 Against difficult opponents like T8-9 tank destroyers or T9 heavy/medium tanks with high penetration guns there isn't much chance of bouncing but the M6A2E1 still has a good health pool of 1500 to fight back with. The tank is at its worst if exposed to threats on more than one side. 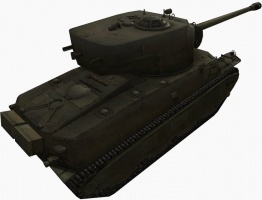 No tank enjoys being flanked but the M6A2E1 is a massive target which will take full HE shell damage from very ordinary guns on the rear and sides and that is uniquely bad among heavy tanks at any level. Strong tactics for this tank are nose-first corner peeking/shooting and leading pushes along roads or natural corridors where an enemy cannot easily bypass its strong front. Sidescraping is not valid for the M6A2E1, travelling across open ground is extremely dangerous and hiding in bushes requires more bushes than you can see through. Mobility is capped at 29kph which is easily reached except in rivers/swamp but the engine power shows its worth on hilly terrain where power/weight is more important. While not a map crosser it has good consistency in the speed it can reach. The speed limit does mean you need to consider that you are likely to be second or third to any distant choke points early in the game. After the invasion of Europe, the US Army expected that there would be a requirement for a limited number of tanks with extremely thick armor and powerful armament to break through heavily fortified areas. 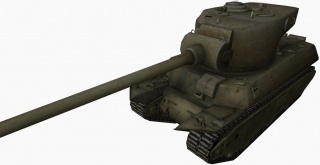 It was proposed that the T1E1s be modified by removing the bow machine gun mounts and the driver's vision door and then welding additional steel plate on the front to provide protection equivalent to 190mm of vertical armor. A new turret was to be installed mounting the high velocity 105mm gun T5E1. This turret, designed for the new heavy tank T29, required an 203cm diameter turret ring compared to the 175mm ring on the T1E1. However, it was considered feasible to modify the hulls to accept the larger ring. It was believed that 15 of the T1E1s could be modified in 90 days, if the required high priorities could be obtained. Out of the 20 production T1E1s available, the remaining five were to be used for spare parts. On 14 August 1944 modification of the 15 tanks was recommended, they were designated as the heavy tank M6A2E1. The goal for delivery was set as 15 November. The Army Ground Forces had been cool toward the project from the first and the Army Service Forces had referred the matter to General Eisenhower in a cablegram dated 2 August 1944. His reply on 18 August stated that the 15 modified tanks were not wanted as they were considered impractical for use in the European Theater of Operations. This effectively killed the project and probably it was a very good thing. Tests at Aberdeen on a T1E1 loaded to the expected 77-ton weight of the M6A2EI showed that it could not climb a 40 per cent slope. Since it was not considered practical to change the final drive reduction in the time available, the M6A2E1s would have been limited to operation on favorable terrain. 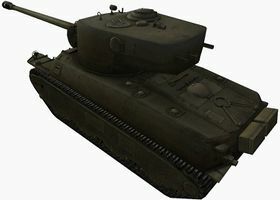 After cancellation of the project, it was requested that two M6A2E1 s be completed to test the turret and armament for the new heavy tank T29. This request was approved and two turrets, gun mounts, and fighting compartments armed with the 105mm gun T5E1 were completed and proof fired at Aberdeen Proving Ground. The two M6A2E1s were not fitted with the additional hull armor specified in the original project since it was not required for this test program. On 14 December 1944, US Army classified the heavy tanks M6, M6A1, and T1E1 obsolete and subsequently the tanks were scrapped except for a single T1E1 once on display at the Ordnance Museum at Aberdeen.